In one of the towns in which I lived as a child there was a church that called itself “Berean”. I’ve noticed quite a few such establishments, and I wonder if many people know what it actually means. It’s a reference to a group of ancient Jews who lived in a town called Berea, and who were among those who experienced the early ministry of the apostle Paul. They listened to the gospel Paul preached; and yet they didn’t just trust it. They checked it out for themselves, comparing his New Testament teaching with the word of God in the Old Testament. Acts says that they “received the message with great eagerness and examined the scriptures every day to see if what Paul said was true”. In other words, they were skeptics. They didn’t just believe anything anyone told them. Nor did they reject out-of-hand anything new. They “examined the scriptures” for themselves. Now, notice it wasn’t just anybody they were doubting. It was the apostle Paul himself. And notice that it was not just any message they were checking. It was the gospel itself. And yet these ancient Jews were described in scripture as “noble-minded”. I guess that means that God doesn’t mind when we double-check his word. In fact, he loves it. That’s because God is as good as his word. When we check, we’ll find out what stands and what does not. God’s truth will stand — do you believe it? Fine to say. But if you are a Christian who is truly practicing a “Berean” nobility of spirit, then you will be one who reads scripture for himself or herself, and makes up his or her own mind. You will not be one who simply takes as given whatever comes off the platform in your local congregation. You will not be a follower of church creeds or “statements of faith”. You will never be one of those people who says, “This is the way we do things around here”. In short, you will not be conservative. What do I mean? What’s the difference between a “conservative” and a “Berean-minded” Christian? The difference is this: the latter is forward-looking, and the former is backward-looking. The conservative always asks, “How can we hold onto what we already have?” But the Berean-minded Christian always asks, “How can we become more biblical, more obedient and more practical in our faith than we have ever been before?” The conservative romanticizes the past; the Berean believer knows that all human endeavors at faithfulness fall short of the perfection of God, and so he restlessly, continuously seeks better for the future. That’s why the Berean Christian stays humble and teachable, and the conservative just becomes hard. The Berean believer is on an unending journey of discovery. The conservative is retrenched in fear. The Berean believer is the hope of the Church for the future; the conservative is not going anywhere. And he’s taking the local church with him. On the other side stands the liberal. The liberal Christian embraces change; but he’ll take it from practically anywhere. It could be the latest church reform guru, the newest book on the shelves, or even the corporate practices of a hamburger franchise. Just as often, he makes things up based on what his “common sense” tells him; or he polls the congregation to find out what others will find pleasing. The liberal rarely goes to his Bible to check out whether what he’s advocating is according to truth. And when he does go there, more often than not it’s to grab a verse out of context so he can justify what he’s already decided to do. Or it’s to investigate only long enough to confirm that “The Bible doesn’t talk about that”. If it doesn’t, then whatever he’s been thinking of doing is cleared for takeoff. The idea that the scripture wants to speak to his total attitude, to give him broader principles or to reform his attitude of self-sufficiency never seems to occur to him. He’s too excited about his plan. He may be forward-looking: but that’s where his resemblance to the Berean believer ends. The liberal is not really interested in checking new information against the scriptures. He’s impatient and immature; and in his foolish innovations, he often plunges the local church into confusion. Changes go ahead with insufficient thought, little prayer, and no modification by the Word. Today, the controversies within evangelicalism are often positioned as “left” versus “right”, the liberals versus the conservatives. What’s not often noticed is that these are not really alternatives. The liberal and the conservatives have a great deal in common, in fact. Both believe they know what the local church should be doing. Neither one has any patience for searching scripture: the liberal left, because they think it is really obscurantist — a trick of the right to slow them down and interfere with the changes they want to see — and the conservative right, because they think they’ve already done it. They believe that other “faithful” people before them have essentially done all the searching that needs to be done; and now that we have our creeds, statements and routines, any talk of reform is seen as a criticism of the “faithful past”. Neither side has the Berean attitude. Neither side thinks there are any answers in the scriptures that have not already been had. Neither is interested any longer in making the church more obedient. We’ve got to stop “flying off” to the right and left. We need to ground ourselves in the word of God. To stretch the analogy, notice that a “wingless bird” will move: but it will only move as fast and far as the ground beneath its feet will allow it. Ungrounded Christianity is never a good thing. “Holding fast to the Head” is the only way that the local church meets its challenge to obedience in each new generation as it comes. Neither unprincipled innovation nor hide-bound conservatism can do this. So I hope those “Berean” believers in my hometown were more than Berean in name. I’m fairly certain that in most ways they were not liberal. I hope equally that they were not conservative. Either one is a bad way to be. A Christian who understands what it is to have the Berean attitude does not derive his politics from left-wing liberalism or right-wing conservatism. His theology, and his whole philosophy of life, is to search out truth for himself or herself, trusting the Spirit of God to lead him or her into all truth, just as the Lord promised. Such a Christian knows that there has never been a time when a church attained the perfect measure of faithfulness; it can always be improved. But he also knows that the world has never had answers to spiritual problems, so he doesn’t listen to the unprincipled voices of change. His dedication is to Christ, not tradition or the latest fad. 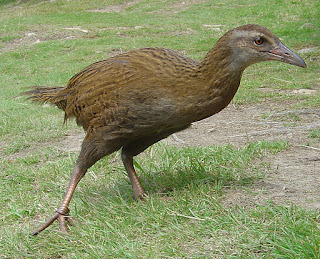 Like Australia’s New Zealand’s famous kiwi bird, he’s got no “wings”: just two feet he keeps on the ground. It seems to me that the kiwi is the national bird of New Zealand. Yeah, but are they Christian kiwis?